We flew to North Ronaldsay by the ‘Flying Landrover’ – the nickname for the Islander aircraft that links the Orkney island of North Ronaldsay with Kirkwall, the Orkney ‘capital’. It has, oh, eight seats, or nine if you get to sit next to the pilot. There are no in-flight movies offered. I’d never flown in such a small plane on a scheduled flight. I couldn’t help but notice as I climbed into the thing that one of the tyres on the landing gear looked soft. But what do I know? Anyway, 18 minutes after we took off from Kirkwall we hit the gravel of the North Ronaldsay strip, the plane veered right, then pilot corrected and all was well. Later we heard it had suffered a puncture – and one that I’ve dined out on ever since. Hey, intrepid adventurer, or what? (Pictured here) Britten-Norman Islander aircraft on the airstrip, North Ronaldsay. North Ronaldsay is the most northerly island of the Orkney archipelago. We spent a wonderful, warm, still day wandering around, trying hard not to look like serious birders. This was difficult as my travelling companion was carrying a tripod and a telescope. Heck, maybe we were serious birders? I’ve tried to record this island honestly, though the temptation, as the sun was shining, is to photograph it as a pastoral idyll – but then, I blame the sheep for that. Ah, yes, the North Ronaldsay sheep – the little sheep that trace their heritage via the Vikings back to Neolithic domesticity. Pictured here: Linklet Bay and the lighthouse - while in the other direction, the wall that encloses the interior of the island and keeps the sheep close to or on the shore. Oh, and the golf course is here as well. In fact, the sheep give the island its special ambience, or smell, in this case. These woolly beasts are genetically disposed to munch seaweed. They are kept on the shore by a dyke (a wall) that is itself a protected monument and stretches for 13 miles / 21km all around. It creeps a bit inland at the delectable Linklet Bay, where the sheep nibble the sward and make it as flat as a golf course green. We later discovered that, in fact, it actually was a golf course green, though we didn’t see any holes as such. But then, this island does its own thing. Today’s working North Ronaldsay lighthouse, 139ft (42m) tall. (Pictured here) Today’s working North Ronaldsay lighthouse, 139ft (42m) tall. Somewhat inevitably, there are sheep in the picture too. You can't get past 'em. North Ronaldsay – the first lighthouse. Undergoing restoration in 2012. We headed off for the north end of the island, where there are two lighthouses, a very early one being restored as a historic structure – only the third ever built in Scotland by the Northern Lighthouse Commissioners back in 1789. The other, dating from 1854, is the tallest land-based light in Scotland. Anyway, North Ronaldsay Lighthouse, the new one, was first lit in 1854 and received its double white paint band in 1889, in order for it to be identified more easily by day. In the picture (possibly somewhere above, or maybe below or left - responsive websites, eh? Beats me...) you can see the tall lighthouse, the sheep and the wall (oh, and a planticruive just left of centre). North Ronaldsay in a nutshell really. 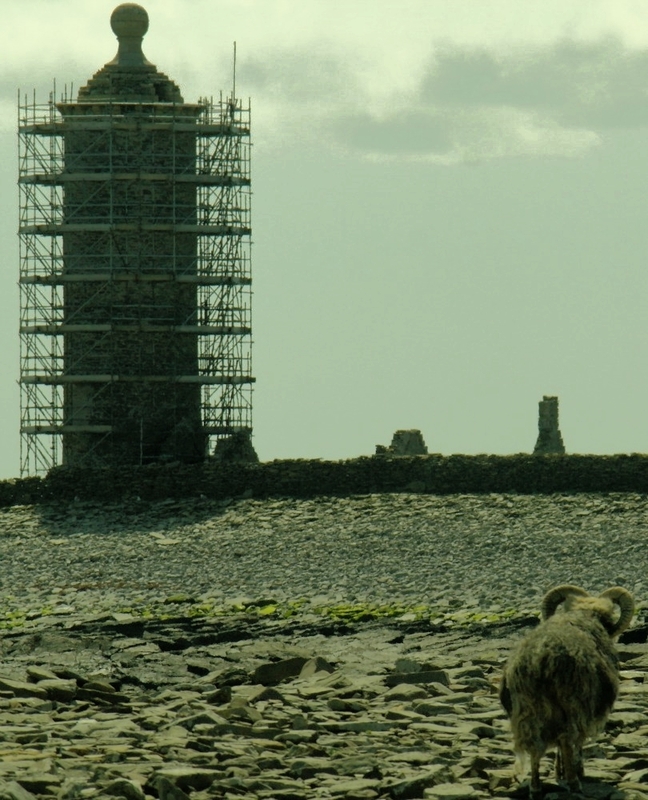 The silhouetted old lighthouse picture shows the scaffolding rather too well, as this historic structure was undergoing restoration on our visit. Unless I photographed a very large stone pasta jar in error. Inevitably there is also a sheep in the pic because I didn't have the heart to crop it out. Don't these sheep just get everywhere? Just as interesting, up at the north end are the remains of what the information board said were unique to Orkney – circular stone enclosures for protecting young cabbage-things (or kale). In Orkney they are called ‘crues’. In spite of the board’s information, they are not unique and serve much the same purpose in Shetland, where, spelled in a variety of ways, they are ‘plantie-cruives’, also a ‘Google-whack’, by the way. Yet more planticruives, with Fair Island just visible on the horizon. Plantie-cruives, or crues, pictured above, with Fair Isle in between on the horizon, faintly. And everywhere, the sheep. Wait a minute, a chance to reduce the population. North Ronaldsay Mutton Pie is on the menu at the cafe below the lighthouse. 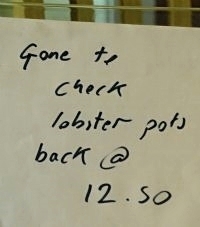 Wait another cotton-pickin minute though: there’s a notice in the cafe that says the guy in charge has just gone off to check his lobster pots. It’s lunchtime and – well, that’s funny – he was here a minute ago and sold us two skeins of native wool. And furthermore, isn’t that him walking across the field in a wet-suit, carrying a surf board? What the…? And how is he going to pull up creels from a surf board? What kind of an island is this? So how do you recycle stuff in Orkney's most northerly island? Linklet Bay with rusting stuff. (Pictured here) Linklet Bay, North Ronaldsay. Sorry about the rusting heap. Two lighthouses and a communications mast on far horizon. As well as these funny wee sheep everywhere near the sea, there are the other features that add so much to the remote island ambience. (Pictured) There is this ancient pile of metal rubbish, for instance. OK, I could have stepped beyond it and taken the photo that would have appeared in the tourism brochures of Linklet Bay. But I’m not writing a tourism brochure, so I might as well be honest with you. Oh, there was also this abandoned sofa, (pictured). It isn’t easy getting rid of stuff on remote islands. Obviously best to just ignore it. This is another aspect of the brochure phrase about the island of North Ronaldsay: ‘the island that time forgot’. (Pictured here) Near Linklet Bay again. Yes, this was once a much loved sofa. Island wall to the right. Towards the north, we passed houses with their own car museums attached – the politest way I can think of describing them. (Pictured) Looking south on North Ronaldsay. Observe the smug-looking cattle who get to eat real grass inside the wall and feel superior to the sheep outside. To make matters worse, the young cattle, if they are white, all like to sit together (right of centre) in the field and look like sheep. This annoys the real sheep even more. En route to the south end, we found a signpost directing us to Gretchen Loch, which has a bird hide overlooking it. (I’ll get to the birds in a minute.) To get to the hide, you walk across a couple of fields towards the sea, with a curious standing stone on the way. Anyway, unavoidably, you meet that pesky but practical sheep-dyke again, at this point so high it would keep out marauding Norsemen. So we have to walk on the landward side of the dyke, along the loch shore to reach the bird hide. And then we have to clamber over the wall to get into it. Grrrr. Now, excuse me again, but I thought the whole point of a bird hide was that you were able to approach it screened and without alerting any avifauna in the vicinity – not walk along at the edge of the loch and in front of it to actually get into it, in the meantime alerting every nervous duck and wader for hundreds of yards in all directions. See? They do things differently here. It was hot. Uncharacteristically warm at least. We were ready for a drink, having walked for miles – so we visited the North Ronaldsay Bird Observatory (pictured here) and ordered Orkney beers. Not only did a charming young lady serve us but she also came outside with us to sit in the sunshine and chat amicably about how she had come up to the island of North Ronaldsay from the other end of England with her fiancé to work here. She answered all our questions and we had a lovely time, admiring a panorama of islands spread out to the south across a glittering sea. See? They do things differently here. The North Ronaldsay Bird Observatory seems a great idea as a base. They cater not just for birdy folk, but for normal people as well. (I’m sure I should phrase that better, but you know what I mean.) Click the observatory picture for more info. Oh, and about the birds. The island of North Ronaldsay isn’t quite as famous as Fair Isle, plainly in sight on the northern horizon. But it gets its share of, frankly, bizarre things that turn up. You’ve just missed the rosefinch earlier, they said. And the Icterine warbler and the paddyfield warbler, for goodness sake. And the American golden plover. Heck, you could get really birdy here after a few days. 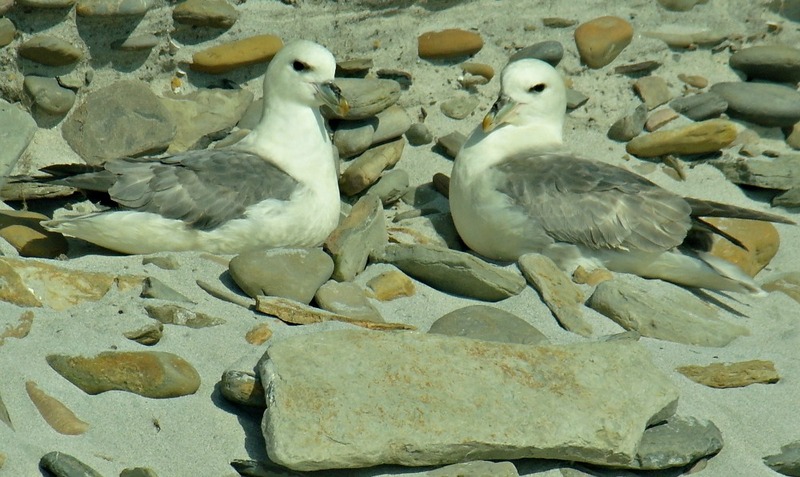 Apart from the rarities, there is always plenty of other commoner things to see, and the fulmars (pictured here) are a bit bizarre. Normally cliff nesters, hereabouts on the island of North Ronaldsay they just seem to claim any space that’s available with a bit of shelter. They have become ground nesters and thus easily photographed. By the end of the afternoon I was expecting to see puffins in trees. Just as an aside, I see the North Ronaldsay Bird Observatory blog of the 1st September 2012 makes reference to stranded fulmars. They get inside the perimeter wall amongst long grass and, as they usually launch themselves off cliffs, they get stuck when there isn’t enough wind for take-off. In fact, sometimes the observatory staff have to resort to fulmar tossing, to get the birds aloft. See, they do things differently here? Then it was time to fly back to Kirkwall from the island of North Ronaldsay. We waited in the general purpose waiting room at the airstrip, with the fire crew, who were pretty much locals, and we learned lots more about the island. I wanted very much to kick the plane’s tyres before boarding but resisted it. Our flight back over the green islands was flawless. Pictured: Lama Ness, Isle of Sanday, from the plane. Overall, I’d go back to North Ronaldsay and stay at the Bird Observatory, though probably anonymously, in case they read this page. There is a broch site on the east side of the island we didn’t have time to explore. And several hundred North Ronaldsay sheep we didn’t say hello to. A settled spell of good weather is to be recommended; though there are a couple of ferries a week as an alternative to the plane – the famous ‘Flying Land Rover’.